BROOD is a software application designed to help project teams in drug discovery explore chemical and property space around their hit or lead molecule. BROOD generates analogs of the lead by replacing selected fragments in the molecule with fragments that have similar shape and electrostatics, yet with selectively modified molecular properties. BROOD fragment searching has multiple applications, including lead-hopping, side-chain enumeration, patent breaking, fragment merging, property manipulation, and patent protection by SAR expansion. 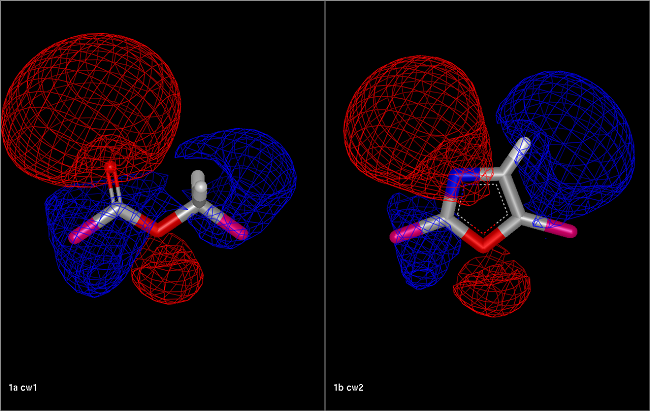 Comparison of an ester fragment and an oxazole fragment showing the electrostatic isopotential contour surfaces. The electrostatic tanimoto between the two fragments is 0.54.